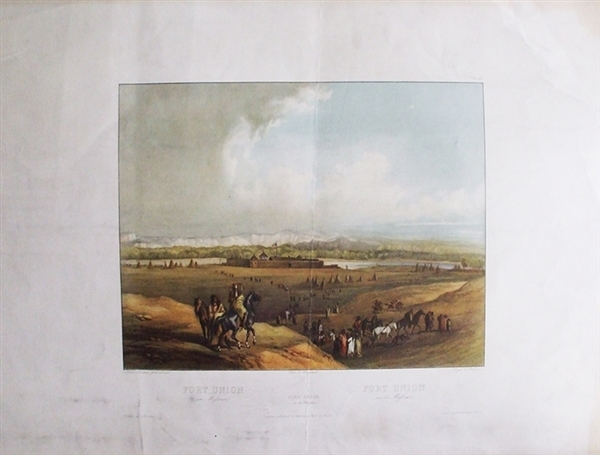 "Fort Union on the Missouri", image 12-1/2” x 9-3/4” on sheet 23-1/2” x 17-1/2”, with title “Fort Union on the Missouri, published by Ackermann & Co., London, c1840, nice yet could use a professional cleaning. A fine view of Fort Union from "Travels in The Interior of North America" by Maximilian, Prince of Wied-Neuwied. In 1832, the German prince, Maximilian of Wied, organized an expedition to explore the region along the Missouri River. He was accompanied by Karl Bodmer, a young Swiss artist, who recorded in pictorial form all he observed. Following the Lewis & Clark trail up the Missouri River, they traveled 5,000 miles during the course of a year. Maximilian kept detailed notes on a day-by-day basis for his book, which was published c.1839-44 in Coblenz and London. Karl Bodmer's landscapes, portraits, and splendid scenes of Indian life are regarded today as the finest picture histories of the western frontier at that time. Engraved by Charles Beyer and Lucas Webber. Fort Union was a major trading post of the American Fur Company. It was erected in 1828 near the confluence of the Yellowstone and Missouri rivers, on the Montana–North Dakota border. Between 1828 and 1867, Fort Union was the most important fur trade post on the Upper Missouri River. Here, the Assiniboine and six other Northern Plains Indian Tribes exchanged buffalo robes and smaller furs for goods from around the world, including cloth, guns, blankets, and beads. A bastion of peaceful coexistence, the post annually traded over 25,000 buffalo robes and $100,000 in merchandise.